2016 has proven to be a very complex year; we lost some of the greatest cultural figures and witnessed the unpredictability of international politics. Yet at the same time it has been an extremely fruitful and productive year for KinoVino. So many people say they can’t wait to see this year out, but I am extremely grateful to 2016 for all the wonders it has brought. This year KinoVino saw some of the most memorable gatherings; it was featured in British Vogue, became part of AirBnB’s new project – City Host – and has served as an incredible platform for my creative and professional growth. It has also laid a foundation for some formidable projects that will take place in 2017 and I can’t wait to share those experiences with you all. The line up for KinoVino supper club is nothing short of spectacular – we start the new calendar with a Beirut-themed night featuring chef Bethany Kehdy, make sure not to miss a Valentine’s date with chef Romy Gill, MBE, and enjoy the night of Bollywood romance and outstanding Indian food, you can also look forward to exploring East London on a plate as I team up with Rosie Birkett for an East End-themed KinoVino in March, and we will travel the spice route to Iran with Yasmin Khan in April. There are plenty more collaborations and exciting projects, including a special KinoVino-Konstam popup with chef Oliver Rowe and a partnership with Kinoteka Polish Film Festival. It has been a true privilege to work with so many talented chefs and to have the support of our guests, for which I am truly grateful. I wish you all a very happy Christmas and all the best for 2017! 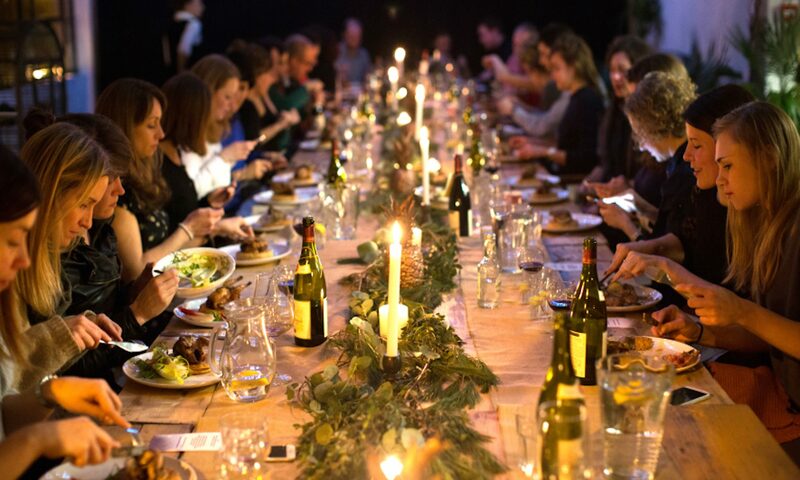 A fairytale KinoVino that captured the spirit of Babette’s Feast! We shared a truly wonderful night filled with some very special energy. It was really lovely meeting so many people passionate about film and food, and to see them have so much fun. The food was outstanding as always thanks to chef Oliver Rowe. This event marked a year of our KinoVino partnership, and what a fruitful collaboration it continues to be! The night was captured beautifully by Rosalind West. It would not be an exaggeration to say that a screening of Tarkovsky’s Mirror followed by Olia Hercules’ feast was one of the most magical experiences of my life! Mirror is a film that has so many meanings to me. It was the subject of my MA thesis and the one that inspired by PhD research. It’s significance and meaning continues to evolve with me and it was truly special to screen this film as part of the KinoVino supper club. Not to mention that the event was featured as part of Curzon’s Tarkovsky retrospective and we had the privilege of screening a new remastered copy. Olia Hercules is a dear friend, who is a source of inspiration to me. Her support of KinoVino is invaluable and her talent as a chef turned our meal into a poetic experience. Who else could match the unique cinematic vision of Tarkovsky! A cine-culinary trip to New York via the pickle shop! I love revisiting old movie classics – they really are the biggest treasure and have that unique power to transport you into an era that is long gone. Crossing Delancey is definitely one of such films! Not only does it capture New York of 1980s but also has some of the most wonderful references to the Ashkenazi Jewish food culture. A film whose protagonist falls in love with a pickle man from Delancy street? Well, that’s a perfect KinoVino movie right there. And who could take on the challenge of creating a meal inspired by pickles if not the one and only Kylee Newton, owner of Newton and Pott and author of The Modern Preserver. With the help of Oliver Rowe, she created the most imaginative and delicious feast featuring pickled produce. It’s been a really incredible experience to launch a new cookbook ‘From Source Spain’ by Lonely Planet. Instead of hosting a generic launch, we turned it into a Spanish-themed KinoVino and gave our guests a chance to take a cine-culinary journey across Spain. Transforming Calvert 22 gallery into a Spanish courtyard we hosted two magical nights of Spanish cinema, food and wine. The screening of Almodovar’s classic ‘Women on the Verge of a Nervous Breakdown’ was followed by a feast of Spanish classics from the book, executed to perfection by Tom Hunt and Oliver Rowe. We heard stories from the book’s author Sally Davies of her culinary adventures in Spain and enjoyed some of the most incredible octopus dish that ever graced the plates at KinoVino, as well as some fantastic Riojas and of course the iconic gazpacho! Guests we treated to some gifts and hammers from Lonely Planet as well as live Spanish guitar performance.